2017 Law Apps Bake Off winners (from left): Jessy Xie, Byron White, Rachel Hovenden and Joseph O'Neill. The app was designed by MLS students for Victoria Legal Aid (VLA) and aims to reduce the pressures on duty lawyers who provide free legal support to those who cannot afford it. 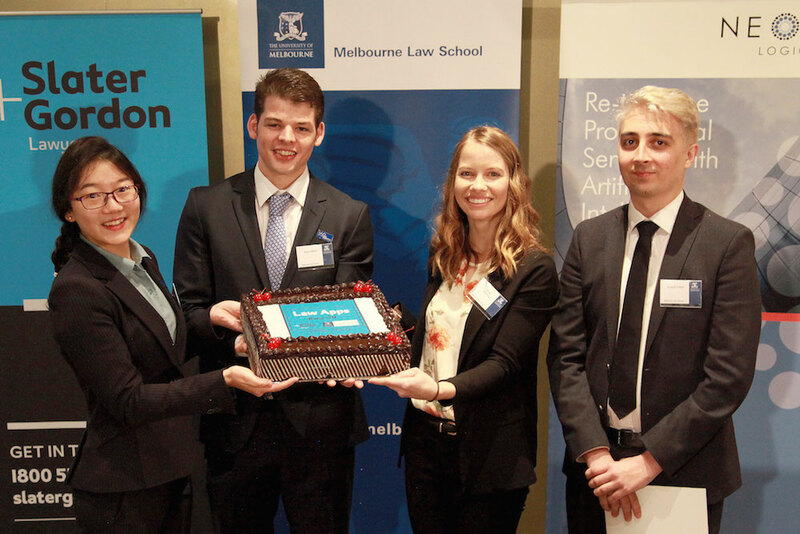 Presenting their app at the Law Apps Bake Off, the winning team – MLS students Rachel Hovenden, Joseph O’Neill, Byron White and Jessy Xie – stressed that the idea at the heart of their invention was accessibility. “The app is part of a last line of defence, so it needs to be accessible to everyone,” O’Neill said. One element of the app that especially impressed the judges was the fact that Legal Aid clients could use the app in either English or Mandarin Chinese. “With an app in your own language, you are encouraged to explore all your legal rights and options,” said team member Jessy Xie. 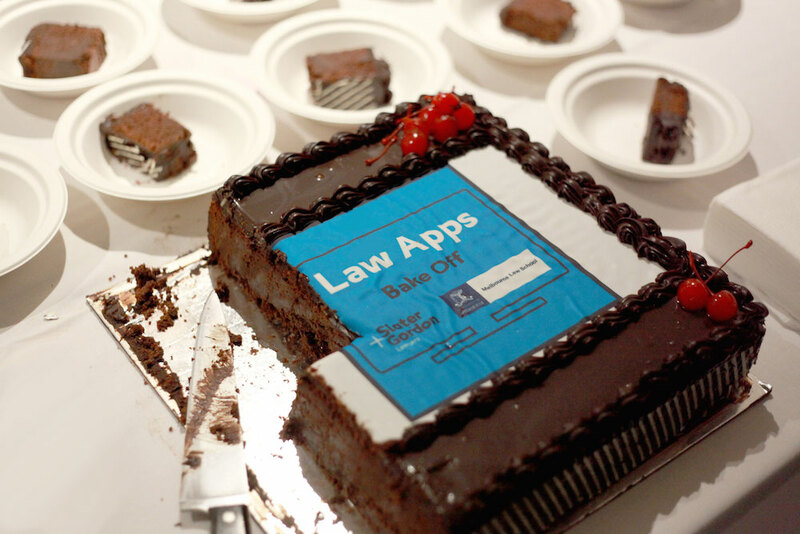 The Bake Off is an annual competition for students in the MLS subject Law Apps. Over the course of a semester, students learn how to build live legal expert websites using software-development technology supplied by Neota Logic. This year, students worked with Justice Connect, Victoria Legal Aid, Environmental Justice Australia, Consumer Action Law Centre and Refugee Legal. MLS Senior Lecturer Gary Cazalet, who teaches Law Apps, said that the subject enabled future lawyers to solve real-world problems with technology. “At the essence of all these apps is the belief that justice should be accessible. Yet the cost of legal assistance often means that it is not,” Mr Cazalet said. Accessibility was a common theme throughout the evening, with numerous teams taking steps to make their apps user-friendly not only for people with no legal experience, but also those facing other barriers to justice such as linguistic diversity or geographic distance. Slater and Gordon General Manager of Personal Injury (Victoria) Dina Tutungi, who was one of the competition judges, praised all teams for delivering “end-to-end” solutions for their clients. The 2017 Law Apps Bake Off was held at the Woodward Conference Centre on Thursday 25 May. Watch the video here.